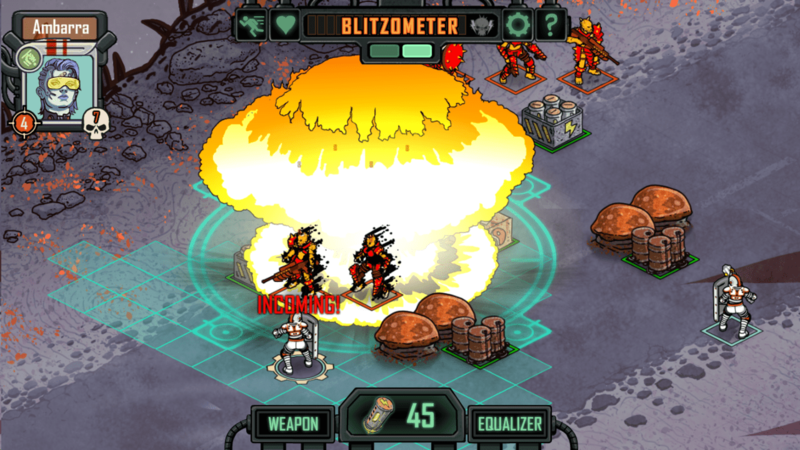 Skyshine’s Bedlam has you managing a War Rig-like Dozer and its crew on a journey from the technological metropolis of Byzantine, across the wasteland of Bedlam, to the fabled salvation of Aztec City. It all feels like FTL, XCOM, and Fallout got together for a wonderful little romp, put to an incredible soundtrack that is the result of a similar romp between Borderlands and Grim Dawn—not to mention a wonderful art style and animations, which are truly a joy to behold. There’s a lot of inspiration drawn from a lot of games here, and you’d be forgiven for meeting Skyshine’s Bedlam with an appropriate level of anticipation. 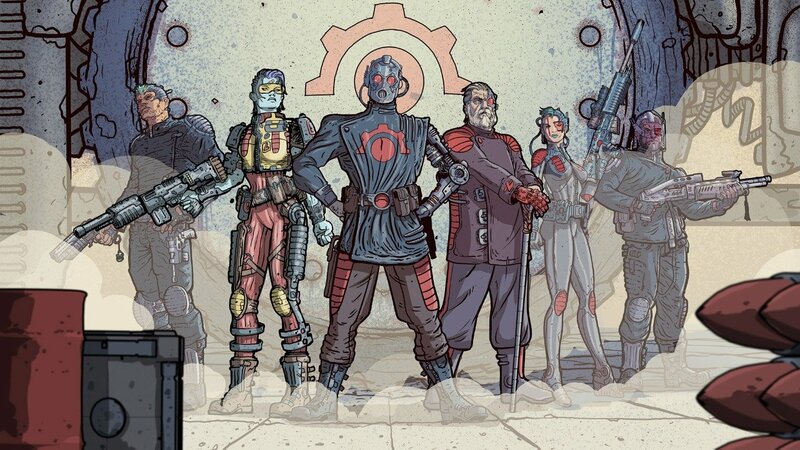 The obvious parallel to draw upon when attempting to summarize Skyshine’s Bedlam is FTL. Surely this is no coincidence, as the game features a similar A-to-B narrative, with a similar optional branching path along the way. Where things really differ, though, are on the battle screen. 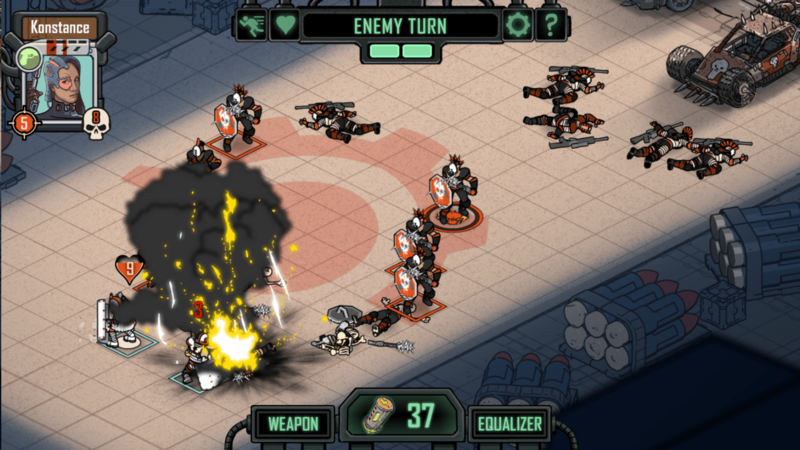 Skyshine’s Bedlam takes a more relaxed, turn-based approach to its tactical combat, but it definitely favours ranged units over melee—at least with the human faction that’s unlocked by default. This can make for some frustrating, yet rewarding tactical combat. On numerous occasions, I thought myself clever, using a Trencher and her shotgun to push an enemy back a couple tiles, only to have that enemy run over to a Deadeye that was now in range and splatter him all over the wastes. Perhaps more than any other tactics-based game, Skyshine’s Bedlam both rewards and punishes well-thought-out stratagems. Crucially, though, it’s simply not feasible to gather all the extras on the battlefield; learning when to risk your soldiers’ lives to collect precious resources is a learning experience, for sure. Each of the enemy factions feels suitably unique, as does the threat they present to your units. Mutants start at a very low health, but gain max health each round. Stall too long and they quickly become unmanageably resilient. The Rogue A.I. infantry even have the ability to teleport across the battlefield. Yes, it’s as overpowered as you think, and yes, squishy little Deadeye snipers are easily undone by this mobility. Compounding the danger from the four enemy factions is the highly-restrictive attack ranges your soldiers have on the battle map. Each of your four basic unit types has an optimal range, both inside and outside of which they cannot attack. This only serves to reinforce the need to properly think through your tactics, as turn order is not based on a per-unit system, instead granting two ‘actions’ per side, per turn. Sadly, this is what undoes the melee units in Bedlam. Sure, they have plenty of health in an attempt to offset their shortcomings, but without a passive system to threaten surrounding tiles or otherwise facilitate the role of a tank, or even enough damage to punish the enemies they do manage to corner (thus crippling their ability to level up), they’re better left by the wayside for another ranged combatant. In addition, the random placement of units on the battle map not only frequently leaves your units totally surrounded, but also with one soldier or another blocking the line-of-sight of one of your critically valuable Deadeyes. Expending a turn to move them out of the way can easily mean that the enemy’s next turn will end the fatality of one of your soldiers. To balance this out, though, your Dozer features unlockable and upgradeable systems and weapons that can aid you both during and between battles. Back on the overview and travel map, things are no less chaotic on your journey through Bedlam. With each stop on your journey, a series of optional random events will present themselves. With nothing more to judge them on, these little exclamation marks are titillating little extras that offer a dangerous gamble. Like everything else in the game, managing both your resources and your expectations is crucial. I like whimsy in my game, so I don’t mind the steep and punishing learning curve in Skyshine’s Bedlam, but I can see it being easily off-putting to plenty of modern gamers on account of things frequently feeling beyond the player’s control. Perhaps what sets this game apart from others that can be unfairly punishing is that it is, at its core, a RogueLike, whereby you’re not supposed to just waltz through it. In fact, the vast majority of attempts are supposed to end in failure. Thinking back, there are plenty of random events in FTL that—albeit indirectly—culminated in the death of your crew. It’s a genre that’s fundamentally defined by failure; the challenge is simply to progress farther than you did last time. Skyshine’s Bedlam is definitely rough around the edges, and could certainly do with a few balance fixes (and a more rewarding ending), but as a package, I still found it to have a charm that its faults couldn’t quite spoil—if only just. If you can stick with it long enough to learn how to overcome its shortcomings, there truly is a lot of time to be had with Skyshine’s Bedlam, and I consider it a worthy addition to my collection. Perhaps more than any other tactics-based game, Skyshine’s Bedlam both rewards and punishes well-thought-out stratagems.